I’m back! For those who don’t follow me on Facebook or Twitter, I was gone all week at a wedding in Las Vegas. I apologize for my absence, but I had an amazing time and now I’m home and excited get cooking! This Spicy Sausage Pasta was a great recipe to come back to after my trip– warm, spicy, creamy, cheesy and comforting. No one will believe this is a lightened up recipe! 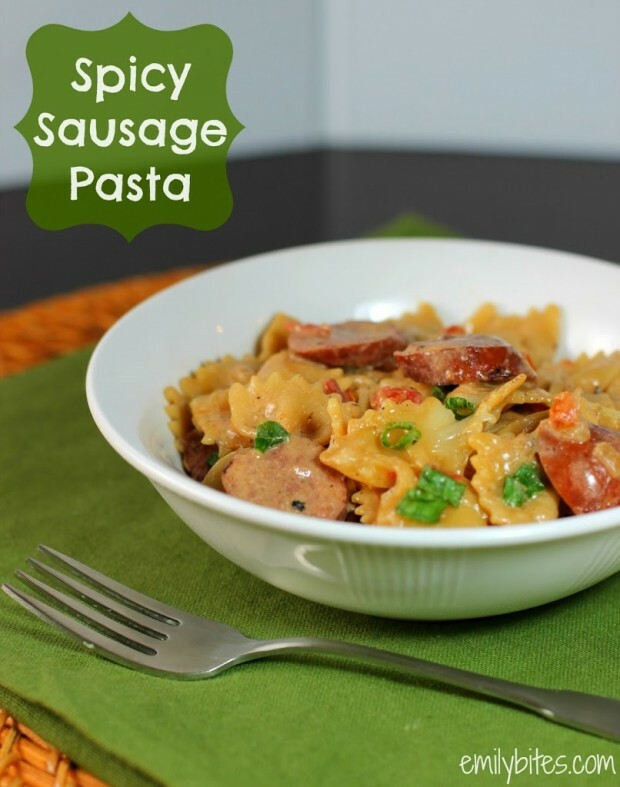 Each serving is chock full of smoky sausage, creamy sauce, spicy tomatoes and chiles and hearty pasta. Not only is this dish packed with flavor, but it comes together super fast. You don’t even have to pre-cook the pasta! It also doesn’t dirty a lot of dishes (which is a real bonus to me because I hate doing dishes). The sauce has the perfect spicy kick, but if you want it to be milder, you could use mild Ro-Tel and cheddar cheese instead of pepper jack. This Spicy Sausage Pasta is the perfect weeknight meal. It’s fast, easy, flavorful, comforting and Weight Watchers and calorie counter friendly. 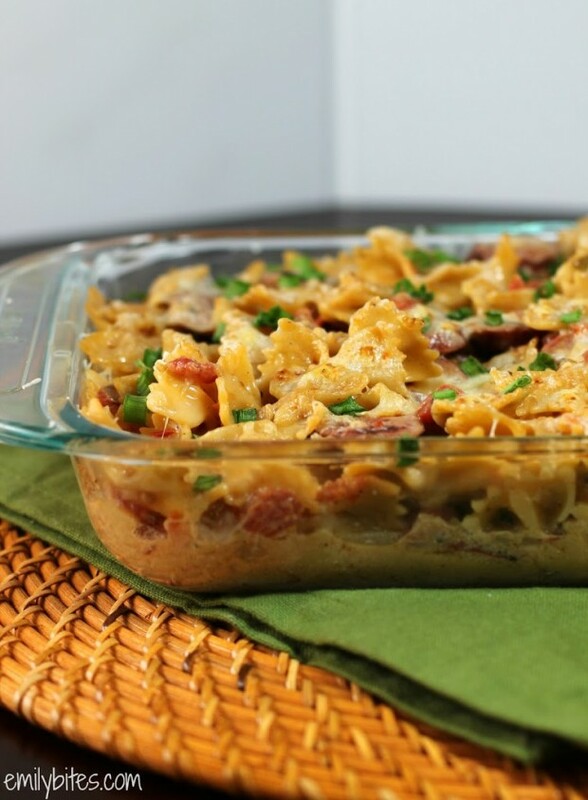 You may want to keep the ingredients on hand because this could become your new go-to dish! In a large dutch oven or sauté pan (oven-safe if you have it), add the olive oil and bring over medium heat. Add the onions and sausage to the pan and cook for 5-6 minutes until sausage is browned and onions are tender. Add the garlic and stir. Continue to cook for another 30 seconds until fragrant. Add the broth, Ro-Tel, half and half, salt and pepper and mix together. Add the uncooked pasta and stir together until the liquid covers the pasta. Cover the skillet and bring the mixture to a boil. Reduce the heat to medium-low and keep covered. Simmer for 15 minutes or until the pasta is cooked. Set your oven to broil and make sure one of your oven racks is in the top 1/3 of the oven. Remove the pan from the heat and mix in half of the shredded cheese. If your pot is oven-safe, you may continue to use it in the following steps. If it isn’t or you aren’t sure, transfer the pasta into a baking dish. I used a 7×11 dish but you can certainly use a 9×13. Can’t wait to try!! I think im going to add mushrooms too. Mushrooms would be great in this! Made this with the mushrooms added and it was amazing! Thank u so much, love all ur recipes! I wouldn’t make this in the crock pot. The sausage is already cooked and the pasta cooks right in the pan. The whole dish takes less than 30 minutes to make. I don’t think it would work as a crock pot recipe. Just found your blog via Pinterest. This looks so good. And under 400 calories a serving. Sure doesn’t look like it would be! Can’t wait to make this. Looking foward ro browsing the rest of your blog! Made it tonight. Very good. Thanks for the recipe. Will be added to the rotation for sure. Going to add chicken next time too. Looks like another winner! Can’t wait to try it. Thanks for the post!!! I’m in charge of making food tonight and I was panicking about what to make and then you posted this on facebook! This looks so yummy and I’m definitely going to make it tonight (though, I might swap the sausage for seasoned chicken)! I’ll let you know how it turns out! Thanks! Perfect timing then! 🙂 I’m sure chicken would be yummy. Let me know how you like it! Chicken worked well. When I make this again I think I will add a red pepper when I add the onions. This isn’t an attack on you but Hillshire Farms & lots of other manufacturers: if you make chicken sausage or turkey sausage/kielbasa, do NOT use a pork or beef casing! It drives me bonkers! It’s actually kind of hard to find chicken & turkey sausages without beef/pork casings! Rant aside, this looks really good. When you say “shredded”, you mean the bags of the shredded stuff right? And not me doing it myself? Thank you for the great recipes, I’ve made a few of them! I shredded the cheese myself (the cheese I used does not come shredded), but you can use pre-shredded 2% cheese if you prefer. Butterball and Jennie-O both make similar smoked turkey sausage, so feel free to use whichever one doesn’t offend you! I have no idea who uses what casings, but if that is important to you then obviously use another brand. I made this tonight for dinner, and we really liked it! I boiled the pasta separately, which I think may have made the sauce a little more watery, so I had to add grated parmesan cheese that I had to help thicken it. My husband and I really enjoyed all of the spicy goodness, but I think it would have been too spicy for my 2 year-old. I’m glad you liked it! Not sure why you cooked the pasta separately, but it cooks up perfectly in the pan with the other ingredients! I suggest trying it that way next time. The recipe is spicy, but you could certainly make it milder if you want. Happy to hear you enjoyed it. This looks delicious! I love when pasta gets lightened up! Making this tonight. Can’t wait!! This looks so good! I pinned it so I will remember to try it soon. Thanks! I made this with Hillshire Farms Chicken sausage instead of Turkey and I could only find Barilla small bow ties (not whole grain)at the store. But even with these changes, the amount of servings seems well over 6. I actually had 2 cups of the dish last night and when I put all the ingredients into MYFitnessPal (which I am using for weight loss and tracking), it said that each serving would be 176 calories for each 1 1/4 cup. That seems really low…I thought this dish was tasty but my family was not thrilled so I’m not sure I will be making it again. Hm, sorry you got mixed reviews! Made this for dinner tonight and am glad that I have plenty of leftovers to take to work for the rest of the week. It was delicious, very simple, and had the perfect amount of spice for me. Delicious! I made this last night for dinner and it was hit with everyone! Thanks for another great meal! Just found your blog on Pinterest and have found so many recipes I want to make. Love that you calculate the WW points and myFitnessPal calories. Thanks! This was sooooooo tasty! Thank you so much for all the great recipes. My only issue was that the pasta took a long time to cook. I think next time I make this ( which will be very soon) I will cook the pasta a little before adding it to the mixture. But delicious!!!! Oh weird, mine only took 15 minutes! I’m so happy you liked it though! Tasty! Used mild Rotel and was plenty spicy for us. Thank you!! Love the one pan idea, used my cast iron 12″ skillet. I JUST bought a cast iron skillet and I am so excited to start using it! Question: the sausage is sliced, right? I can’t see where it says that in the recipe or instructions. Made this for my family tonight – very good!!! I make your recipes a lot, but this is probably my husband’s new favorite! He loved the spicy and creamy sauce. It was a huge hit, and we will definitely be making this one again…and again and again! Thanks for a great find! How long should it be in the oven on your step 3? Broiling really depends from oven to oven. It’s really just meant to brown the top. This should only take a few minutes but I recommend checking every minute or so until it looks right to you. WOW. I loved this! I sliced up a package of Trader Joe’s Italian Chicken Sausage and it was great. I keep picking at it!! I used the mild Ro-Tel and it was just the right amount of heat for me with the Cabot pepper jack cheese. Thanks! I made this Saturday night and not only LOVED it, but have thoroughly enjoyed eating the leftovers! Even the picky eater hubby of mine likes it! Another great recipe! So glad it was a hit with you and your picky husband! I love to hear that. Yummy, this was amazing. I just made it for lunch and I loved it! I only added half a can of Ro-tel and just a small amount of pepperjack cheese so it wasn’t too spicy and it was perfect! I also added just a little bit of colby & Monterrey jack shredded cheese. I will definitely be making this again! We made this tonight! Even had a friend stop by and all of us enjoyed it! I loved the touch of spice! This has gone into our recipe rotation! Can’t wait to try more! Thanks for making the “weight loss” journey easy on all of us with your yummy recipes! This is one of my new FAVORITE recipes– oh my gosh, it was SO delicious. I made it for my husband and myself and after I had my dinner portion, and packed some for lunch for the next day my husband literally finished the rest of it which was about 3/4 of the ENTIRE dish! He said this is his new favorite and I loveddddd it, and it was so easy!! Thank you for another amazing recipe Emily!!! This is my new favourite recipe! The husband said, are you kidding me this is frigging delicious! We have a keeper! Thank you! This was extremely good for it to be so light in calories. I grabbed the wrong cheese in my rush at the grocery store and I couldn’t find the wheat pasta that I like but I was still able to keep it under 400 calories. Awesome recipe, thanks for sharing!!! Oh I almost forgot…on top of all that I couldn’t finish the full portion. It was sooo filling! I veganized this entire thing and its sooo good! Thanks for the inspiration! Made this and it was so good, my husband raved about it. However I was unable to find Smoked Turkey Sausage. I found Turkey Sausage and I found Smoked Sausage, but not the combination of both. So I made with the smoked sausage because I definitely wanted the flavor. I am in MA and belong on a board of local women and none of could find it in our grocery stores. So bummed! But I am on a mission to try to locate this smoked turkey sausage…. This looks delish! I’ll be making this soon! I have made several of your recipes recently and this is by far my absolute favorite! I love spicy food and this pasta is really cheesy and creamy, something I miss in a lot of other lightened up pastas. The Weight Watchers message boardies are always raving about this recipe, so I decided I needed to try it, and I am so glad I did! Thanks, Emily!! Ok let me start by saying, I just started weight watchers on Wednesday, I bought frozen meals while looking up recipes and making shopping list. I stumbled upon your blog and it is amazing! After looking over your recipes I couldn’t decide which meal would be my first EVER healthy dish. I am a long time lover of cooking. I never believed a dish could stand up to it’s potential using light/low-fat/fat-free substitutes. Which is probably why I have weight issues today. I made this dish exactly as written except I used chicken sausage. This dish changed my idiotic thinking that cooking with out butter,full flavored full, and fatty foods couldn’t be fun, and oh so tasty! Thank you Emily Bites for being a part of the beginning of my transformation! Made this for dinner last night, and it was a huge hit! I was hoping to have leftovers for lunch today, but no luck…family loved it. It was so flavorful – will definitely make this recipe again. Thanks Emily for another great recipe! Oh, this sounds so good! I make this with the Mexican cilantro lime rotel and it’s amazing. Gives it a lil spin. I also add a spoonful or so of chopped green chiles for extra spice. I add all the cheese to the skillet and melt it in there to make it a faster and easier meal. Wish I could use scallions but my bf doesn’t like them. This meal is fast easy and amazing! I came across this recipe on Pinterest and made it last night for dinner. The only change I made was using Mexican Shredded cheese in place of the pepper jack so it wouldn’t be too spicy for my kids. Oh.My.YUM! It had so much flavor, was so quick and absolutely EVERY member of my family loved it. I loved it because it was healthy (even though I kept that a secret!) I plan on checking out some of your other recipes as well! I made this for dinner…yum! Thanks! It’s so good!! I make it often!!! I cut this recipe in half (serving for me, my husband and one extra for lunch tomorrow…then buttered noodles for the kids) – I also added some fresh spinach for an extra veggie serving and we LOVED it! Adding spinach is a great idea! Glad you loved it! Made this tonight and it was delicious! Had to leave out the onion since hubby can’t eat it, but added in some mushrooms. We both loved it! This dish is awesome! Super quick with little prep and only a few dishes! Do you have suggestions on altering the taste to something not so spicy? Maybe something italian with mozzerella cheese, but not sure what you would sub for the rotel? In anycase, this was amazing just like every meal Ive made of yours so far! This is by far my favorite recipe, I have made it several times!!! I have also made it Italian style with Italian chopped tomatoes instead of rotel and it was delish!!! I was so excited to see this post. I had the original recipe, and it was delicious. Now that I am doing WW, I can’t wait to try the lightened up version! Made this over the weekend & loved it! I used Hot Rotel instead of original & it really gave it a kick! Gonna try shrimp instead of sausage next time to change it up! Thanks for sharing your recipes! Your 3 for 3! This was easy and delicious. Thank you for all the work you do here and congratulations on your wedding!!! Whoa…this recipe is grand slam! It’s every bit as delicious and satisfying as it looks, more even! I followed the directions exactly and it came out perfect. My husband and I joined WW a few weeks ago and I stumbled on your wonderful blog looking for inspiration and recipes to stay on track and to keep from getting bored with the same old “diet food”. This was the first recipe I tried and most definitely will not be the last. My DH couldn’t stop raving about it and kept asking if I was sure we should be eating it…it tasted TOO good! And it was so easy to throw together and clean up a breeze! Many many many thanks for all the fabulous recipes (and tips)! We can’t wait to try more! Everytime I make this dish it’s fantastic! Except that the sauce turns out really watery. I’m not sure what I’m doing wrong! I pinned this on Pinterest and I make it all the time! My question is how does it freeze? Have you ever made it and froze it for another night? Wow, really enjoyed this dish for several reasons. It is great that it is light since we’re still in new year’s resolution mode. It is quick and super easy. I bought hot chicken sausage which needed to be cooked and it was still east. I had almost everything cleaned up and put away by the time it came out of the oven. My husband loved it too! We had it for dinner and there is one good size portion left for lunch tomorrow. We like things spicy so added some Frank’s hot sauce. I will try it with the hot rotel next time and maybe some spinach for extra nutrition boost. Thanks! So happy you loved it! Thanks for letting me know :). I think spinach would be great! About a year ago I was making this weekly and then it dropped off the rotation. I made it again last night and it was so yummy. I seriously love this stuff. I like that’s it’s really filling. I decided to freeze up half of it into mini portions for quick lunches. Thank you for this recipe, it is one of my favorites!!! Probably a silly question, but what is “half and half”?! I made this for dinner last night. I personally love spicy food so I kicked this up a notch by adding some crushed red pepper flakes to it!! Sooo good, even though some members of my family found it a tad too spicy. All in all this recipe is a hit and I will be making this again in the future. We have made this numerous times and each time I make it a little different. It’s on a bi-weekly rotation with our family. LOVE it! I make a similar dish, Johnny Carino’s Spicy Romano Chicken with Artichoke Hearts and Sundried Tomatoes which is delicious but very heavy on claories. I am anxious to try this recipe which is much lower in calories and much easier to make. I love, love, love all your recipes and I know I won’t be disappointed. Keep up the good work! Thanks Sandy, I hope you love it! I know this is a stupid question and I make your recipes all the time with no trouble until today. In all of your recipes do you weigh or measure your cheese? I know this is an older post, but we just made it for the first time. Used picante salsa for the rotel and chicken brats, and it was SO YUMMY! Love your recipes!! I wonder how many SP it would be without the cheese … anyone know?